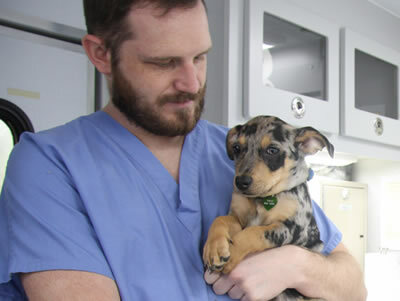 The Doctor of Veterinary Medicine professional program at the College of Veterinary Medicine boasts a unique curricular structure, which provides nearly two years of hands-on training in the college’s general and specialty clinics. Years one and two of the four-year program focus on instruction in high-tech, computer-based classrooms and labs. Years three and four provide clinical instruction in such areas as ophthalmology, cardiology, orthopedics, oncology, dentistry, community medicine food animal and equine medicine. The location between two metro areas – St. Louis and Kansas City – and adjacent rural areas offers a strong caseload in companion, equine and food animal species – and opportunities for collaborative research, instruction and pursuing preceptorships. Preceptorships during the third and fourth years are supported by a new database system and a preceptor coordinator who ensures that each student is guided toward the opportunities that best match their individual interests. Veterinarians throughout the Midwest refer animal clients to the Veterinary Health Center for specialized diagnoses and treatment in specialties, such as emergency medicine and critical care, soft tissue surgery, dentistry, ophthalmology, neurology, oncology, dermatology, cardiovascular medicine and surgery, and orthopedic surgery. Our community medicine practice also offers preventive medicine, dentistry and routine small animal outpatient services. The College’s Shelter Medicine Program increases opportunities for students to develop their hands-on clinical skills while helping area humane societies serve their communities. MU is a national leader in comparative medicine, in which researchers collaborate by sharing discoveries, innovations, and treatments for animals and humans. For more than three decades, the National Institutes of Health has continuously funded comparative medicine research at the University of Missouri. The College of Veterinary Medicine has been and continues to be an essential partner in this research. The MU One Health/ One Medicine Mizzou Advantage initiative opens opportunities to expand on pioneering work in comparative medicine by connecting research and instruction in health care delivery, policy, business models, medical ethics, and the culture of healthy living. The Veterinary Medical Diagnostic Laboratory is the only nationally accredited diagnostic laboratory in Missouri and one of only five in the Midwest. It handles more than 40,000 diagnostic cases a year and serves all of Missouri’s 114 counties and surrounding states by performing approximately 20,000 diagnostic tests annually. The facility supports toxicology, histopathology, serology, bacteriology, molecular biology and virology diagnostic laboratories. It also provides the opportunity for veterinary medical students to receive instruction in diagnostic laboratory medicine. The Veterinary Health Center provides a wide range of clinical services on the MU campus, and Veterinary Health Center Wentzville provides diagnostic services, radiation therapy and clinical trials in the St. Louis area.